Prevail Premium Quilted Washcloths with Lotion - Soft Pack Press Open Lid, 12" x 8"
AllegroMedical.com presents The Prevail Premium Quilted Washcloths which are made with cotton for superior softness and performance. The Quilted Texture creates pockets for a more complete cleaning with overall less waste. Single-Hand Dispensing® ensures a single, unfolded wipe dispenses for added convenience and less waste. These are packaged in a soft pack with an easy open and close lid that locks in the moisture and keeps the wipes fresh as long as the tub packaging does. Single-Hand Dispensing®: By combining pop-up folding and a special lid design, a Caregiver with one hand, can pull a single unfolded washcloth each time without reaching in, adding convenience and reducing waste. Soft & Strong Tri-Form™ Fabric: A unique three layer fabric: the two outer layers are made of a soft fabric to be gentle on the skin; the strong and thick inner layer prevents tearing or stretching for effective cleaning and for keeping hands cleaner. Premium Quilted Fabric: The texture of our Quilted Washcloths creates pockets for a complete cleaning using fewer washcloths. This unique feature enhances pericare. Skin Smart®: A combination of Aloe, Chamomile and Vitamin E that helps moisturize skin. Vitamin E & Aloe: Promotes skin wellness and reduces dry irritated skin. Ingredients: Water, Cetearyl Isononanoate, Ceteareth-20, Cetearyl Alcohol, Glyceryl Stearate, Glycerin, Cetheareth-12, Cetyl Palmitate, Disodium Phosphate, Propylene Glycol, Tocopheryl Acetate, Phospholipid CDM, Aloe Vera Gel, Disodium EDTA, Phenoxyethanol, Methylparaben, Propylparaben, 2-bromo-2-nitropropane-1, 3-diol, Fragrance. works well. Resealable top. Easy to open. Skin cleaning. Not for nose blowing. This is how happy you will be. soft. no scent. no allergic reaction. big size, use fewer. These wipes are nearly twice the size of an ordinary wipe, have no odor at all, so are much more convenient to use for a disabled sensitive patient. How I wish they were available in local stores! Allegro has made it easy to get them tho and I appreciate it. 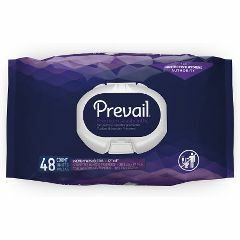 Will you reorder the 96 count Prevail Adult washcloths that are lotion enhanced? Definitely! I have been using these for several years and they are the best ones I've found.